Wisdom of Life. : Perfectionist might not be happy people. Are you a perfectionist? Think twice before you say Yes! I believe nobody could be perfect. 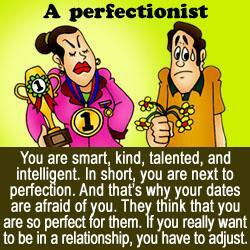 I don't think perfectionists are happy people. I have a lady friend who preaches perfectionism in her life. She speaks perfect language and expects to hear perfect replies from her friends. The slightest pronunciation or grammar spoken wrong, she would correct you immediately. She loves to dress at her best in colour and matching. Each time when she sees her companions clothed with a minor defect, she would not hesitate to correct them. She expects good food and drink to be served. Her home is in tip top presentation. Look at her bathroom and you could see how clean it is at all time of the day. She professes well professionally in her career and serves efficiently to her clients. She treats her parents better than her siblings, offering financial support ever since she started to work years back. She seems a great admirable lady to her friends, clients, relatives and parents. However looking at her face, especially through her eyes, I could feel she isn't truly a happy person inside. Reason... Being a perfectionist she is, her expectation in life is extremely high in nature. She could be very stressful when she doesn't get the expected returns. Emotionally she could be sensitive and overreact, turning her feminine character to be arrogance and violence at time. Finally the unfriendly attitude and behaviour lead her to be lonesome when no compatible partner is able to cope up with her strong personality. I like this proverb - “The true meaning of life is to plant trees, under whose shade you do not expect to sit.” Nelson Henderson quotes. I like the story. May I suggest that u take her by the hand gently and ask her about happiness, how she sees it and whether she has found it! With your stature as a matured youngman of wisdom, I m quite sure she will respond. Then u can help her accordingly to share your life's wisdoms. And wth yr help, happiness will not be so elusive for her anymore. Or you may be surprised that she is already happy in her own way! Will take your advices and suggestion. A wise man has to learn from a greater wiser man. No need to pull my leg Bob! The little things I learn are all derived from such great friends like you, all wiser in 1 way or another. TQ Bob for all good things. With little imperfect, then only can be perfection! For sure there is nobody on earth could be perfect. Those who thought they are.... are usually very demanding people. I'm not perfect at all but I try to do my best in any under taking for others. Even on bed, i try to make the best out of it... but there are still a lot of room to improve. Right young man?